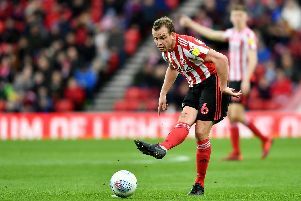 Sunderland have made a terrific start to the League One season - and a new study reveals the key men in Jack Ross' side. The Black Cats are yet to suffer a league defeat to find themselves fourth in table, just two points behind leaders Peterborough United. When it comes to goals scored and goal conceded, Sunderland have found the net 13 times and let in five. But enough of the basic stats, with the help of Bwin, we delve into the strengths and weaknesses of Sunderland's play and learn who the key players are in their bid for promotion, based on the last three seasons. Sunderland are the best team in League One at scoring from set pieces – 30.6% of the goals scored by the club have come from set piece (33 goals in the last 3 years). This is more than any other time in the entire division. Chris Maguire completed a summer move from Bury and he is listed as Sunderland's main goal threat, as well as assists king - collecting the same amount of goals and assists (17) as well as scoring and creating every 336 minutes. Max Power was another man mentioned in the assists bracket.The midfielder has provided 14 which accumulates to creating a goal every 523 minutes.